Bought these off Ebay, and was told they would recover in a week or so. Well it has been nearly 4 weeks with no real change in the plants health. Will these leaves die off and grew new leave with fresh mucilage? also there are new growth points on both plants, will these divide into new plants? I have an aliciae (which looks very similar to a spatulata and has the same care requirements) that I got four weeks ago and the thing looks utterly miserable. All my other plants around it are growing and dewing happily. The important thing right now is whether it is putting out new growth. 1) What kind and how many hours of light is it getting (direct sun, artificial)? 2) Is the soil mix peat/perlite? That's what it looks like from here. 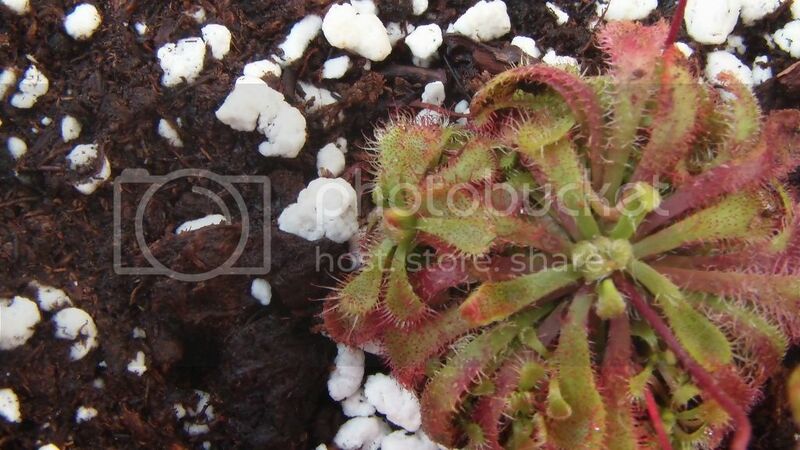 3) Are the plants putting out new growth but it just doesn't dew up and the tentacles look all scraggly? 4) What kind of water are you using? In the immediate, I would cut off the flower stalks while they are acclimating to maximize energy put into leaf production - however, this is not necessary. Keep in mind though that a spatulata will flower several times a year. They also divide naturally, like you can see in your photos of all those smaller spatulata growing underneath the mother plant, especially visible in that last photo. 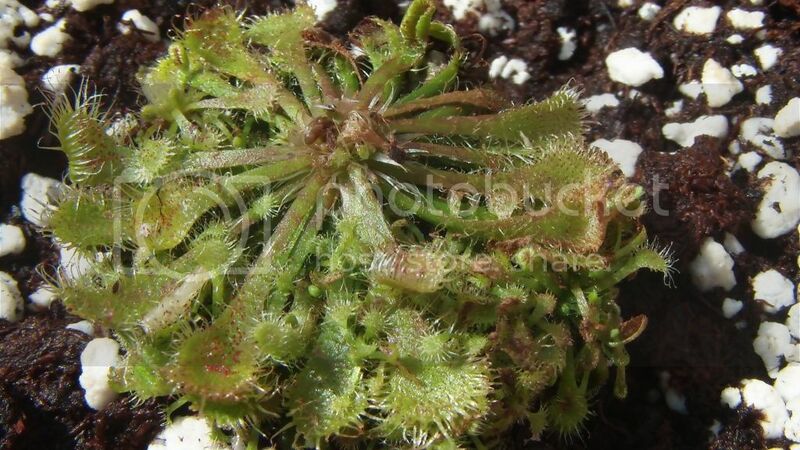 Eventually a spatulata, if you leave it alone and don't divide the plants, will look more like a dewy drosera bush. Like all plants, old leaves will die as new leaves continue to grow. 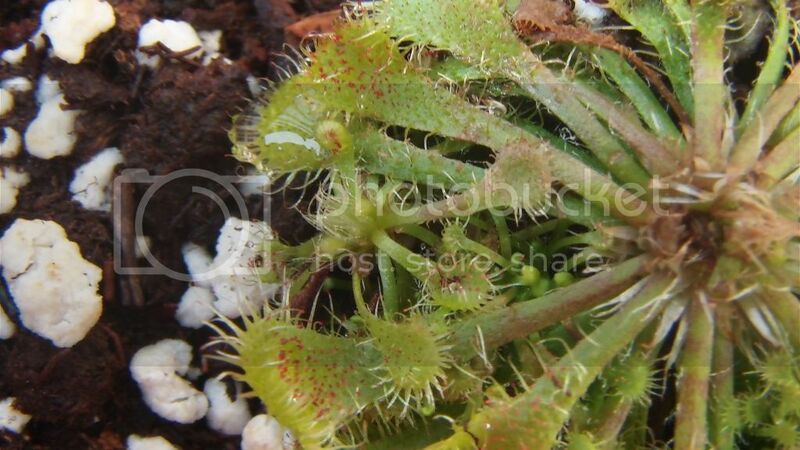 The new leaves will have dew on them if they are getting enough light and are otherwise not stressed (due to shipment, improper water/soil, etc.). Here are some pictures of spatulata from a recent post that you can look at as a gauge. Yeah, my previous Spatulata I received from Joel on eBay looked like the one you had. It basically died within the 3rd week. It had very short roots and my media wasn't right for it's growth. My second one that I received looks amazing and healthy. So far it's still acclimating, but it's looking to be very healthy and promising. I read about cutting off the flower, but since I didn't spend much on these plants I figured I would leave them alone and just care for them as I normally would and let them do their thing. I've read that thes eplants are hard to kill so i figured that they would get situated on their own. There are new leaves coming in it just doesnt look like theres much dew on them. as for the regular spatulata, it is not flowering, but it doesnt seem to be reviving the leaves. should i prune off the dying stuff? Your conditions are good, I only wonder about your temps right now. Spatulata are hardy plants so you should be fine. Some people literally chop the plant off to ground-level (leaving only a little nub and its roots under the soil) at the end of each growing season and they just come right back. You can prune the leaves, but to be honest I don't think it's worth it for the most part. I never trimmed mine. Leaves die often enough that if you decide to prune dead leaves now, you will probably just say "ah, screw it" later. Dying leaves can also still produce plantlets, which can lead to that "spatulata bush" look sooner. 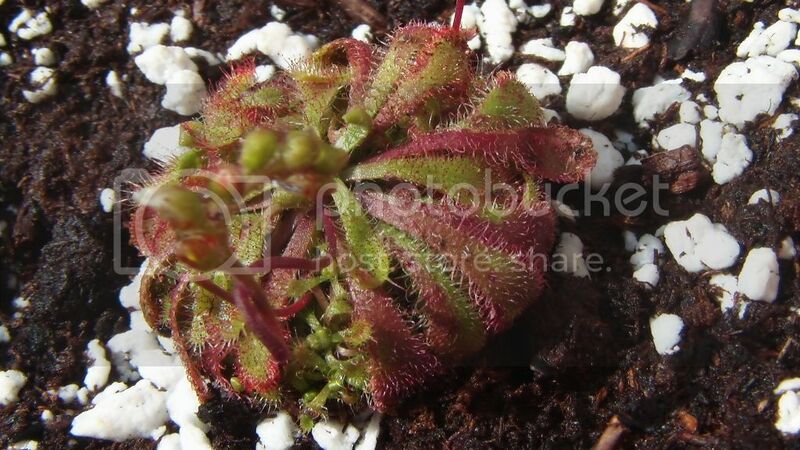 As long as the sundews are getting adequate direct sunlight (around 6+ hours per day *direct* sunlight is ideal), they should dew up for you once acclimated. The primary factor for dew production is light. It might also be that the reason they aren't dewing is because of temp. What are the temp ranges outside day/night? These are tropical plants, temperate conditions like most Northern states' current Spring weather isn't ideal for them. Since you moved them outside, the change in environment from where you got them may have been a great shock to them. This could cause dewless leaves until they acclimate, which can take a couple months. ^That has to be it. It must be the night time temps. current night time temp right now is 64 degrees. Day temps have been hovering around 70 lately. I'll pull these guys inside my apartment where it's 74 and put them back under my grow lights on the 12 hour timer. They definitely get plenty of light, I would say at least 5 hours a day direct sun, and 2-3 hours indirect or filtered sunlight. It must be the temperatures. Thanks all so much for the input. Also, they were sort of acclimated to the outside day/night temps before I moved them out there. My plant shelf was adjacent to my sliding glass doorwall in which we leave open at night. So I'm sure they got a little taste of what their new environment was like, even if it was not suited for them. Np, hope that was the problem. Let us know how they're doing in a month. You'll probably have dew by then. You might consider upping the cycle to 14 hours if it won't mess up your other plants (they aren't fruiting or flowering). Lastly keep in mind that if left under artificial lights for extended periods, they lose their sun-hardiness, so tossing them from your lights back into full sun in a month may result in its newly-created growth getting fried. I would acclimate them back to full sun over a period of a week or two to be safe. Sounds good! I'm not worried about my other plants, they're all outside, only being pulled indoors for the night if temp drops below 60 or if frost is in the forecast. Even my cacti and succulents are outside and LOVING it! I grow all of my Spatulatas in west windows inside. A number of them are currently flowering. I'll post pictures in a couple weeks when they're back to normal health. Keep them at around 8ish inches from the lights if you can, or as close as they can be without getting too much heat from the bulbs. What kind of grow lights are they? CFL's? I had a spatulata (and some other CP's) under a single 125W (650W equivalent) CFL, 6500K, on a 15 hour cycle. Here are a couple pics of what it looked like a few months later. It was somewhere around 8 inches from the light, plus or minus an inch. Mine weren't in a terrarium; they were in a room with a relative humidity of about 30-40%. Higher humidity from something akin to a terrarium makes the dew look even more pronounced.